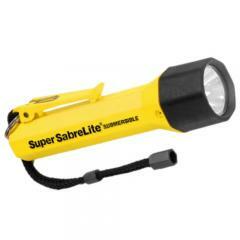 have many standard flashlights to choose from. Pelican's new SabreLite LED is submersible to 500 feet. Advanced super bright Recoil LED Technology® combines the brightness of a conventional light with the long life and durability of an LED. Recoil LED Technology® delivers a lux* reading of over 1,558. That's 32 times brighter than the nearest competition! Light weight body made of Xenoy® with polycarbonate lens and ABS shroud. Flashlight works fine, only issue I have with it is that when the manufacturer describes the light by saying it has a rotary switch no one will understand you have to turn the bezel assembly itself to either turn it on or off. Not the most easy thing to do when your working.